Blue Flight (in pink colours) takes to the air at Kelso earlier this month. Ed Chamberlin will lead the ITV racing team when it makes its appearance at Kelso Racecourse this Saturday (March 23). Together with regular pundits Mick Fitzgerald, Luke Harvey and Sally Ann Grassick, plus the commentator Richard Hoiles, Chamberlin will present four races live from Kelso, including the £50,000 Liz Adam Memorial Handicap Steeplechase. The feature race of the day has proved a useful stepping stone, in recent years, for emerging equine talent. Lake View Lad, who was third last year, is a leading fancy for next month’s Grand National for Scottish trainer Nick Alexander, while the 2015 winner, The Last Samuri, went on to finish runner-up in the following year’s Aintree marathon. While the likely top-weight is the Paul Nicholls-trained Adrien Du Pont, a winner at Kempton’s Christmas meeting, much of the interest will centre on dual Kelso winner Blue Flight. 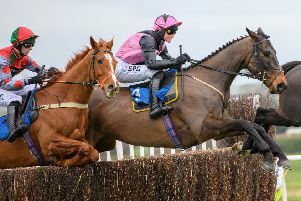 Trained by Nigel Twiston-Davies and owned by Dundee United football club director Jimmy Fyffe, the huge-framed novice chaser is progressing rapidly and looks like a star in the making. Gates open at noon and the official going description is ‘soft’, increasing the likelihood of larger field sizes for the six-race programme, which gets under way at 1.50pm. The first race is the £20,000 EBF / TBA Mares Novices Steeplechase, which has attracted 11 entries, including the five-time Kelso winner Alizee De Janeiro and the classy southern raider Dalila Du Seuil. Trained by Lucinda Russell, Alizee De Janeiro has already won three races at Kelso this season and is likely to head off to stud later in the year. Any progeny will be expected to become hot favourites at the Borders track. 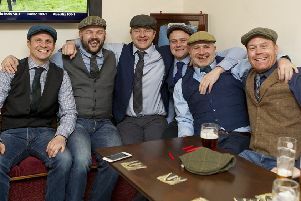 The £40,000 Bernhard Handicap Hurdle, over two miles, is the second race on the programme and, while there’ll be no repeat victory for Keyboard Gangster, the Hawick trainer winner from last year, there will be local support for the James Ewart-trained Aristo du Plessis, the Pauline Robson-trained Martila and Sandy Thomson’s Saint Leo. The ITV programme will be completed by the £40,000 Paxtons Exclusively Kverneland Handicap Hurdle Race. Trainer Sandy Thomson could hold the key once again, as the Greenlaw trainer is triple-handed with Arthurs Secret, Seemorelights and Buckled. Last year’s second, Donna’s Diamond, could be in the line-up once again for Chris Grant in the black and white stripe colours of North East owner David Armstrong. Mount Mews, who won the Premier Hurdle at Kelso when trained by Malcolm Jefferson, is entered for both of the valuable hurdle races on the programme. Now trained by Donald McCain, the Trevor Hemmings-owned gelding declined to race when getting over-excited at Cheltenham where he looked fit and potentially well-treated by the handicapper. The fifth race on the card, which will be run immediately after ITV goes off air, is the Ashleybank Investments Reg and Betty Tweedie Handicap Chase. Named to commemorate the influential couple, both of whom became patrons to the racecourse in their own right, the race offers Caraline an opportunity for back-to-back wins after her strike for Middleham trainer Micky Hammond last year. Rebecca Menzies has her horses in great form and she has already booked Conor O’Farrell for recent Catterick winner Halcyon Days. The biggest entry on the entire card is for the final race, the Ferguson Planning & Development Handicap Hurdle, which could divide if more than half of the entries declare to run. The race is well supported by Lucinda Russell, whose four entries include Ain’t My Fault, Saint Freule, Sammy B and Touchedbyanangel.